After lunch & some swimming, we set off for another island. Next stop was CYC Beach (CYC = Coron Youth Club) and Quin Reef. 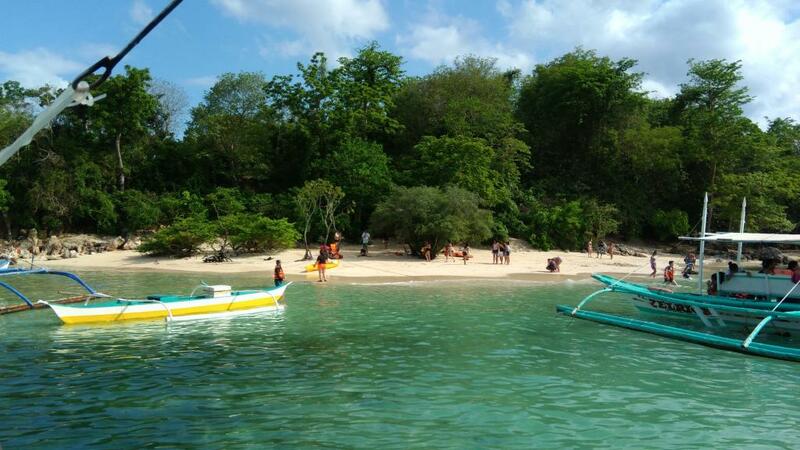 You can go ashore & explore the beach, or swim, kayak or snorkel. My group rented a kayak (P1,000/day or ~20 USD) and we took turns in kayaking. Snorkel masks can be rented from your hotel/GH or from one of the shops at the pier. I had my own swim goggles & didn't rent a snorkel mask - just surfaced for air once in a while. I can swim but I am not a strong swimmer, so I always wore my life vest in deep waters. Sometimes, I pitied the non-swimmers in my group bcos they were afraid to take a dip, even if they wore life vests. During those times that they didn't swim, they just took pics, chatted or relaxed on the boat. In each destination, you'll stay for ~30 min to 1H, depending on the remaining time. It takes ~15-30 min to get from one destination to another. In terms of island tours, I found it easier (and cheaper) in Coron than in Boracay or Puerto Galera. 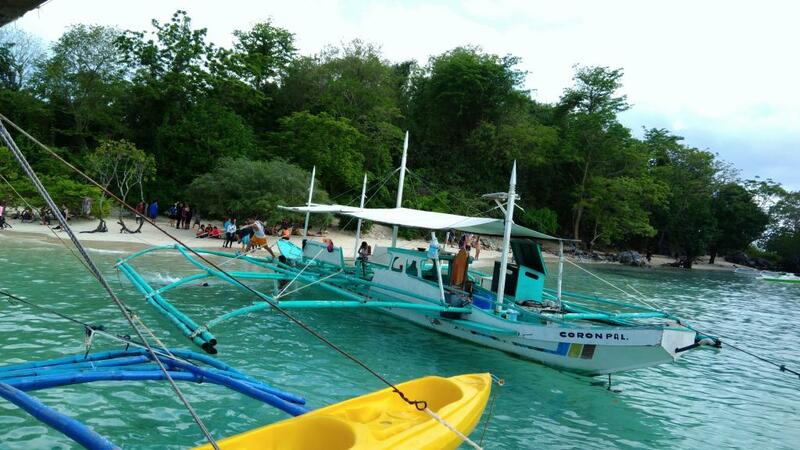 In Bora or PG, you'll have to rent the whole boat if you want to go island hopping. So if you have a big group (~10 ppl), it turns out cheaper per pax. Boat rental in Bora was P 2000/ half day, or ~ 40 USD. That was low season ( Sept 2015), so I imagine they charge more during high season. In PG, it's the same - you have to hire the whole boat. So if you're only 2, it costs more. In Coron (and also in El Nido in Palawan island, Accdg to my friends), the tours are organized into Tours A, B, C, etc, and you pay a fixed price for the tour (which includes a simple lunch). So if you're a solo traveler or a couple/quartet on a budget, you can choose a tour from one of the agencies and you'll pay a fixed price - no more haggling. You'll be "joiners" in one of the big boats. If you want to give a tip to the crew, it's up to you. They have a tip box in the boat, or you can give it directly to one of them. My group always gave tips, because we know that their job is seasonal and there are lean times with no/few tourists. Or there could be typhoons = no flights or boat tours, as the coast guard wouldn't allow it. It's also possible to hire a private boat for your group (if $$$ is not a worry). If doing so, it's best to tell your hotel/agency the day before, so that they can arrange it. They have a to arrange a crew & one has to go to market to buy food for your party. 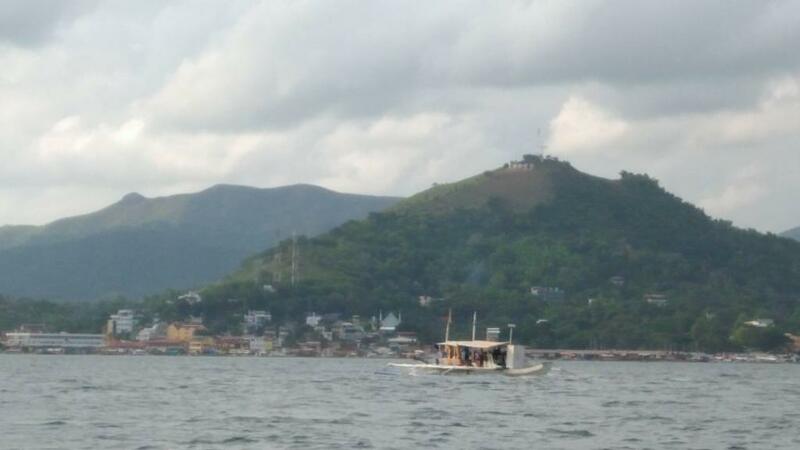 According to our guide, most of the boats in Coron are now tour boats & not fishing boats anymore. They have to "import" fish from Mindoro, the neighboring island. Then Typhoon Yolanda/ Haiyan (category 4) came in Nov 2013 and wiped out his boats, so he had to start anew. 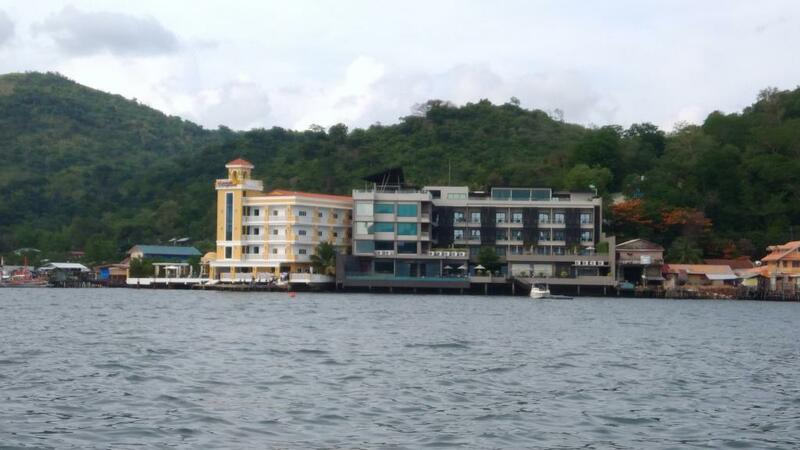 He was able to rebuild, and now he has 18 or 19 boats, plus the tour agency, the GH and higher end resort. He said he meets his staff once a month to give them pep talks, reminders, etc. He said he told his staff to be honest and work hard, as it will pay off in the end. He's relatively young - 45 y.o, and has accomplished a lot. Very inspiring story. If you don't like reading the stories, just skip the text. I'll put pics in another post. I just want to tell the stories while they're fresh in my mind. This was CYC Beach & Quin Reef. We did some swimming, snorkelling & kayaking. Kayak rental was P1,000/day or 20 USD. Next stop was Las Islas de Coral and Green Lagoon. The latter is named as such because of its color (heh!). We did more swimming, snorkelling & picture taking. Nothing appears when you click on these two links Katie. ^That's because Mao hasn't put them up for her yet. ^^thanks PAG for reposting the pics. My collaborator Luigi is still prolly sleeping off a hang over. I'm an early bird, so I prefer to post pics early - the net is also relatively faster. I'm browsing TD in between doing housework. Cheers & happy Sunday to everyone! After Green Lagoon, it was time to go back to the pier. There were some large hotels (4 storey) which had seaside views. The disadvantage of Coron (over El Nido or Boracay) is that you can't get a hotel/resort which is beach side. You'd have to go to an island hopping tour for the beaches, or stay in another part of the island, like probably in Busuanga town. But you can get seaside or mountainside views, depending on your hotel. There are no international hotel chains yet like Marriot, Hilton, etc, and I hope it stays that way at the moment. A colleague said that in 2012, there was no large hotels (4-5 storey) yet. Tourism is still relatively new. My sis went to Coron in the 90s, for a uni tour wherein they observed the marine & wild life. She said that during that time, it was a small fishing town and there was no electricity. 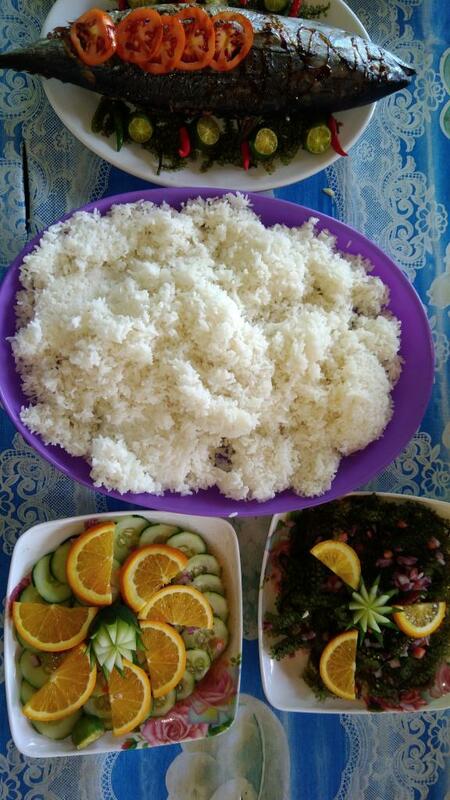 They stayed in a local's home, and the host cooked their meals. They slept on mats or matresses on the floor - very basic accoms. Now, in the town proper, there are lots of shops, some restos & bars, tour agencies, and variety of resorts, guesthouses & 4-5 storey hotels. The waters were so clear everywhere too. My advice to anyone interested in visiting, is to visit within the next 5 years. I already saw some signs of mass tourism - Koreans, Chinese, Japanese groups, as well as white foreigners (mostly backpacker age). There were also a few older whites, most of them had Filipina GFs/ wives or partners. According to a friend who's a good swimmer & went far away from the boat in one of the sites, he saw some empty plastic bottles lodged in some corals. He wanted to get them but he wasn't that confident to dive & he was alone. My reaction was, Tsk Tsk - oh no.... I also saw (and heard) some Chinese tour groups at the airport while waiting for the plane back...and it was another "oh no" moment. But to be fair, some Pinoys throw trash indiscriminately too, and aren't responsible travelers. If you really want an isolated island resort, my group went to 1 small island (Bulog Uno) on the 3rd day. It has a small beach, white sand, totally isolated. Simple rooms with A/C cost P1,500 per night or ~30 USD. It's good for lovers or those who want solitude. I don't have the contact details, but you could probably ask JY Travel if interested, and they'll find out for you. You'd also have to hire a boat (1.5H travel) to get to that island. Advantage: you'd be totally isolated. Disadvantage: if there's a typhoon, you'd be marooned on a small island with probably limited supplies. There were also some bungalows/ cottages (which looked nice) on another isolated island far from shore. It was said to be owned by a Chinese person - prolly via dummy wife, partner or corporation. I didn't take pics, as I was camera weary (and sleepy) by then. Pics to come of Bulog Uno (the small isolated island) later. Thanks Luigi for reposting the pics. View of the pier & Mount Tapyas. If you try to look closely, there's a cross on top of the hill. My group went there on our 3rd day, 700+ steps. Pics of the climb later. They'll show up just by quoting the post Pag, no need to actually re-post them yourself, as you then get a double set of the same photos in the post. The water and beaches at those islands look bladdy sublime K-Pop. After a day tour, you'll get back to the pier between 4-6 pm, depending on your activities & the waves. There's no place to wash up in the small islands. Sometimes there were roving boat salesmen, selling chips, iced candy, drinks (soda & beer). Then it's back to hotel, wash up, prepare for dinner. If you're in a tour package, dinner is not included in the price; only breakfast and lunch are. Since we stayed in budget accoms, there was only 1 type of breakfast available - the Pinoy "silog" breakfast, consisting of rice, egg & something (sweet pork tocino, longganisa sausage, beef tapa, corned beef, dried fish, etc). Maybe in the higher end hotels, they'll have American or continental breakfast on offer. Prolly no English brekky - sorry to the Poms. Re: footwear during island trips, it's more advisable to wear sandals than flip flops, as sometimes you have to wade in water. Up to you if you want to wear socks with your sandals. Or some ppl wore "aqua" shoes. There was also a site with lots of sea urchins (the guide warned us about them), so be careful not to step on them. There was also one site which had jellyfish - thankfully no one in our boat was stung. The Russian girl (day 2) had a Go Pro camera - probably got some great underwater footage. One from my group also had a Go Pro (borrowed from another friend) but I haven't seen the vids or pics. Snorkel mask rental was usually P150 or 3 USD. Or some ppl wore "aqua" shoes. ^hey, I have elephant pants! I use them in my trips. No, the aqua shoes are more like the shoes worn by scuba divers. The one they use before putting the fins. I don't know how they're really called but my friends and our guide called them aqua shoes. Guide said that it's better to wear those, since your feet are fully covered even underwater. Some of my boat mates (the joiners) wore leggings for the swim. I think those are safer to wear in some places - less possible sting due to jellyfish & such. I wore shorts always and didn't think to bring leggings (though I have them). Some of the boat crew also wore leggings under their shorts, as well as long sleeved shirts, as protection. If you're not a good swimmer, you're advised to wear life vest while swimming. That's a lot of poor swimmers. From Manila: same as above, plus Skyjet airlines. The planes used are the twin propeller Bombardier Q400 ones, 4 seats per row. On the flight to Coron, the last 10 minutes were a bit rollercoaster-ish. There was some turbulence and the plane had to tilt a bit to avoid the mountains. I think most of the passengers prayed to their God/gods at that time. Since the trip was an all-in tour (5D/4N) inclusive of flights, accoms & boat tours, I don't know how much the flight exactly costs, as it depends on time & sometimes promos. I checked one website, and a one-way flight costs P3,500 or ~70 USD. For budget travellers, there's another way to reach Coron from Manila. It's via 2go ship/ferry. It's an overnight ship travel. It costs ~P2,000 or ~40 USD one way, to travel by ship (tourist class, with A/C). If you're a group or family, you can get the state room, which is good for 4 or 6 pax. The ship leaves Manila 2x a week, every Friday & Tuesday pm. I think the ship goes farther on to Puerto Princess in Palawan island. For more info, go to 2gotravel dot com. Keep them coming, they add so much more. 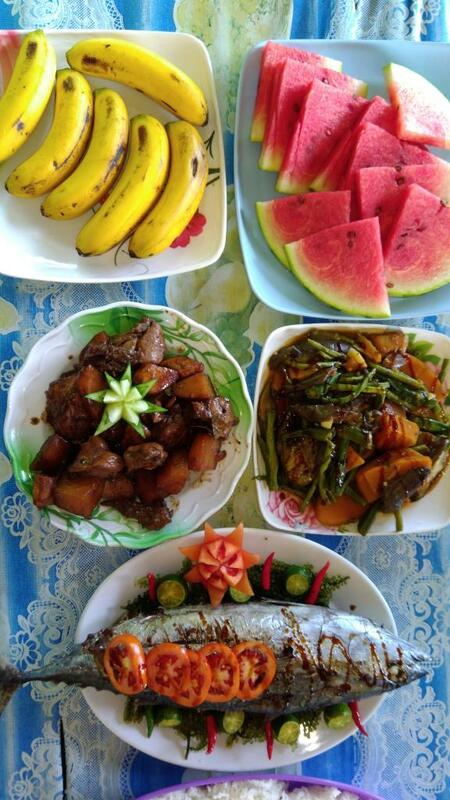 An excellent intro to a Philippine holiday. Stories, info and pictures. This post should be made a sticky for the Philippine thread. Last edited by OhOh; 24-06-2018 at 03:07 PM. 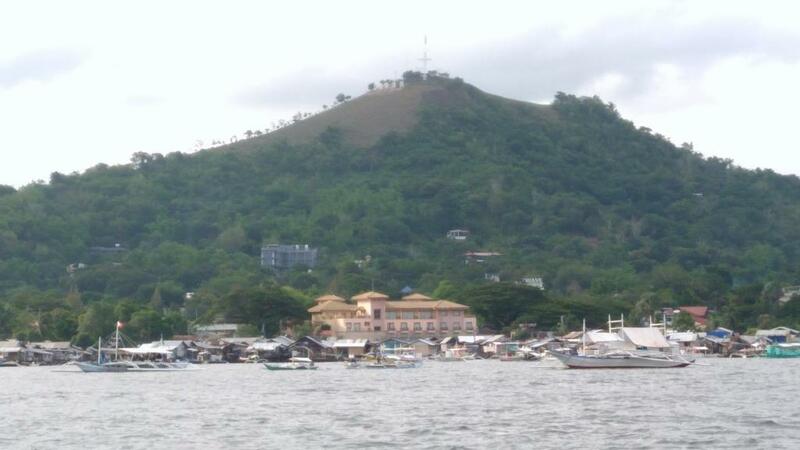 For a nation made up of something like 7000 islands, it's amazing just how many Filipinos cannot swim!. No, the aqua shoes are more like the shoes worn by scuba divers. The one they use before putting the fins. @headworx - yeah, many Filipinos cannot swim. will try to upload more pics later. Got stuff to do & my net is wonky.